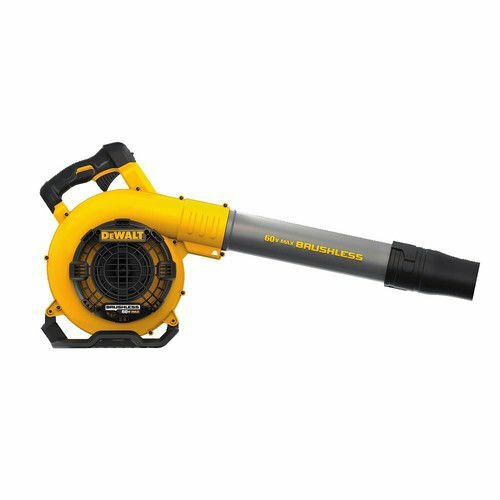 →DeWALT 60V Leaf Blower. Handheld and Cordless: is it Capable? DeWALT 60V Leaf Blower. Handheld and Cordless: is it Capable? Recently, DEWALT took the market by storm with their impressive range of FlexVolt 60V MAX Cordless Outdoor Power Equipment. In the lineup was their 60V MAX Chainsaw, their Handheld Blower, and their String Trimmer, all powered by one FlexVolt 60V MAX battery. Equipped with a brushless motor, a flat concentrator nozzle, a variable speed trigger, and a lock for throttle control, DeWALT’s DCBL770B seems to have everything you could ever need from a blower, plus it’s cordless and super powerful, which makes it a great deal. But is this blower all that’s it's claiming to be? Read our review to find out for yourself! How Well Does the FlexVolt Handheld Blower Perform? What are the Key Features of the DeWALT FlexVolt Handheld Blower? If you’ve been hibernating for the last few years, you’ll be happy to know that DeWALT has changed the way we look at, (never mind what we expect from), cordless power tools these days. Their FlexVolt tech is self-regulating and is backward compatible with other 20V Flexvolt DeWALT Power Tools. Included with all of their FlexVolt cordless power tools you’ll get a three year limited warranty, a one-year free service plan, and a 90-day money back guarantee, just in case you’re not totally satisfied with your purchase. If you’re a lawn care professional, you probably love to hate lithium-ion battery-powered blowers. Why? Because regardless of the marketing claims, cordless blowers just don’t deliver on power the way that you need them to. But as a property owner, you don’t need 200 MPH speeds to clean up your yard, so where does that leave you? It lands you in the alley of battery-powered blowers. With their DCBL770B FlexVolt Handheld Blower, DeWALT didn’t stray off the path they created with their 40V MAX commercial line of PRO outdoor equipment. DeWALT stuck to their side intake design, and in fact, it looks like it might just as well have been the twin of their older 40V Max Blower. Tanks to the side intake method DeWALT is still using; there’s more rotation in the air flow, which is why the manufacturer added a slight S-curve to the nozzle to reduce that rotation. Sadly the design results in a loss of power (although it’s minimal) along with more friction for the air to encounter. The FlexVolt 60V MAX Handheld Blower comes with a cruise control lock for the trigger, which is a mechanical stop that enables users to select power settings required for the specific task at hand. It doesn’t look great, but it does what it was made to do. The variable speed trigger is 2-finger activated, and it also comes with a contoured, over-molded handle which is comfortable and easy to grip, situated around the control center. Furthermore, the lock off switch is a welcome addition to the blower since it allows you to transport or store the tool. With a battery placement to the left side of the handle (rather than beneath it), there’s no appendage which comes down to protect the battery or provides you with a more stable platform to put your blower down on to. The fact that the battery is located to the left of the handle means that there’s less risk of damage should you accidentally drop the blower. When you install the FlexVolt battery to the bare tool, there’s a slight lean to the blower, which is a good thing since the balance evens out. When the balance is on par, the nozzle is kept pointing downward, which requires you to use much less effort to get the job done. The wide blower nozzle can be used for most duties such as clearing clippings and leaves from the driveway. When you start using the flat nozzle, the air volume gets reduced dramatically, which kind of nullifies the blower. According to user reviews on the internet, the FlexVolt Handheld blower doesn’t deliver power which will blow our mind, and if you’re used to a gas-powered blower, it’s not going to cut it for you. We liked the fact that this blower isn’t so noisy. Whenever we think about power tools, we imagine the noises they make. With a noise level rated at 67DB, this blower makes a sound that hovers somewhere between a conversation and a vacuum cleaner, which is much quieter than most household appliances. Another key aspect of the DeWALT FlexVolt Handheld Blower which we really appreciated was the tool’s overall light weight. We want and need power tools to be lightweight because we don’t want to fatigue our arms within minutes, and thanks to the FlexVolt blower’s 9.8 pounds and very ergonomic design, it more than delivers in this department. We like the fact that it comes with a handle which is large enough to accommodate gloved operation, and with the addition of a variable speed trigger, you’ll be in full control of the blowing speed while working. Aside from the fact that this blower lacks in power for professional applications, there are some other areas where improvements would be welcome. Because the FlexVolt blower is set up for right-handed users, has a speed control set up for the right-hand thumb, and has an air intake which is situated on the right side of the blower, left-handed users tend to get their pants sucked into the air intake. Runtime is always an interesting topic when it comes to cordless tools, and depending on the speed you have the blower set on, it can go for quite some time. If you’re using a 3.0 amp battery on high speed, you’ll get about 14 minutes of continuous blowing out of one charge, which is probably long enough to get a quick clearing job done, but you have better options. You can get hold of a 9.0 AH battery and this will run for approx. 3 times as long as a 3.0 AH battery. If you use the blower on low speed, you’ll probably be able to go at it for hours on end. The performance of the DeWALT FlexVolt Handheld Blower is reasonable for property owners, but this tool just isn’t going to cut it for more serious jobs or the professional landscaper. With its moderate air speed and volume, it’s a great tool to use for clearing pathways and sidewalks, but as soon as you start trying to move wet materials on grass, you’re bound to get frustrated.